Having a generator on hand can be a lifesaver during emergencies such as blackouts or natural disasters. It can help the household keep their power going to keep their food from going bad or to run space heaters when the power goes out during snowstorms. Emergencies aren’t the only circumstances in which these devices can be handy, however. Having the best generator available can also mean that you have the power you need for charging an electric car, for powering outside tools and for camping. Of course, you first have to find the best generator possible before you can complete those tasks, but that’s an easy thing to accomplish thanks to the top ten list below that’s been compiled for you. This multi-purpose 1200-watt unit is ideal for anyone who wants to be prepared for the next snowstorm, hurricane or tornado. It’s also a good unit for hunting or fishing, for boating, using on the family RV or for tackling small jobs around the home. It will produce 1500 starting watts and then maintain 1200 running watts during its operation. It has an operating decibel level of 65dBA at a distance of 23-feet and can run up to 10-hours on a full tank of gas if it’s operated at fifty percent load. Other features incorporated into this unit include a built-in surge protector, cold start technology, and a 120V 20-Amp household outlet. With a 7-HP OHV engine that can pump out 3,300 running watts, this unit has enough power to light up some low wattage items such as lighting, as well as a large appliance such as a full-sized refrigerator or a small air conditioner. Which makes it a good unit to keep around the house for emergencies. It has a 4-gallon gas tank that gives about 8-hours of run time at 50% output and is pretty durable thanks to a heavy-duty steel frame. Other key components that are integrated into this unit include a low-oil shutoff mechanism, a quiet muffler to reduce engine noise and an EZ-pull recoil start. Weighing under 50-pounds and powered by gasoline, this portable unit is perfect for a variety of different purposes from camping to powering outside tools and for use during an emergency. It has a quiet 52 dB noise level, and a 12-hour run time at 25% load on its small 1.2-gallon gas tank. This unit has built-in 120-volt and USB ports, so powering small appliances such as TVs or air conditions is quite simple. And if this unit doesn’t supply the necessary power for a particular job, it can be paired with another Westinghouse unit using a parallel cord, which can be purchased separately. Designed to be a portable power source that can be used for a variety of different purposes, the Yamaha EF2000iSv2 has a number of features that make it a very useful tool. It has a starting wattage of 2,000 watts and a running wattage of 1,600 watts, enough power to supply a variety of small appliance and has an inverter system with Pulse Width Modulation control. It is also CARB compliant, a smart throttle that varies engine speed on load and a quiet muffler. Other features found on this unit include a fuel gauge and petcock, the capability to be run in parallel with another Yamaha unit and oil watch warning system. 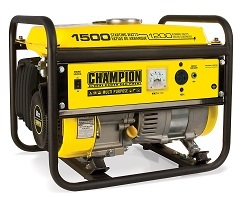 Regardless of whether this unit is used for power outages, for powering small tools around the workshop or for using on campgrounds, this 3,100-watt unit uses a 212cc 4-stroke OHV engine that can operate at 57 decibels when the unit is running at 25% load. This model also has a lightweight design that has a collapsible handle and built-in wheels that make it easy to take from place to place. Other integrated parts found in this unit include 2 three-prong 120-volt receptacles, 1 12-volt DC receptacle, 2 5-volt USB ports and 1 120-volt AC receptacle. It is also equipped with overload protection and a low-oil shutdown warning system. Generating 2,000 surge watts of power, this unit will be found useful by a number of different people for different applications. It provides enough power to power small appliances using a 79.7cc 4-stroke PHV engine that produces only 51-decibels of sound at 25% load, which is quieter than most window AC units. And since it limits total harmonic distortion, it provides power that’s safe enough to run tablets, monitors, smartphones, and computers. This unit is EPA III and CARB compliant and has two 3-prong 120-volt receptacles, one 5-volt USB port, and one 12-volt receptacle. With the ability to run off either gasoline or propane, this unit provides the user with the versatility they need for just about any situation. It can be used out at a campsite, around the home or in the workshop and will provide clean reliable power. It can run up to 9-hours on a completely full tank of gas, has a noise level of about 68 decibels from a distance of 23-feet and provides 4,750 starting watts and 3,800 running watts. Other features this unit has included a propane hose, touch start capability, a safety fuel selector switch, a portable folding handle and never-flat tires. An ideal unit for powering things around the home or on an RV, this Champion unit has 3,100 starting watts and 2,800 running watts and can provide up to 8-hours of run time at a 25% load. It’s fairly quiet with only a 58-decibel level and also has a convenient electric start with a three position ignition switch. It also provides power stable enough for running electronics such as laptops, tablets, and smartphones that are plugged into its dual USB adapter. Other features users can expect to find on this system include two 120-volt 20-Amp household outlets, a 120-volt 30-Amp RV plug, and a wireless remote start. Equipped to deliver 4,000 starting watts and 3,500 running watts, this system can run for up to 12-hours at 50% load on a full tank of gas and only make about 68 decibels of sound from a distance of 25-feet. It’s also equipped with a 120-volt 30-AmpL5-30R outlet, a 120-volt 30-Amp RV TT-30R outlet, and 120-volt 20-amp 5-20R household outlet. It is also designed with an auto-voltage regulator with a voltmeter, a low-oil shutoff sensor, and cold-start technology. And since this unit has a high-quality steel frame that makes it very durable, this unit is sure to provide many years of power. While this might be a stylish looking unit, it’s also one that delivers some serious power. It can power provide power for up to 8-hours on a single gallon of gas and has an operating noise level that’s more than acceptable. And since it’s a compact unit, it’s easy to take from one location to another. This unit is designed to power small appliances such as televisions or DVD players, coffee pots and small refrigerators. It can also be used to power tools on job sites that don’t have access to conventional power sources. All in all, this is a unit that’s sure to provide the power a person needs when they need it without exception.